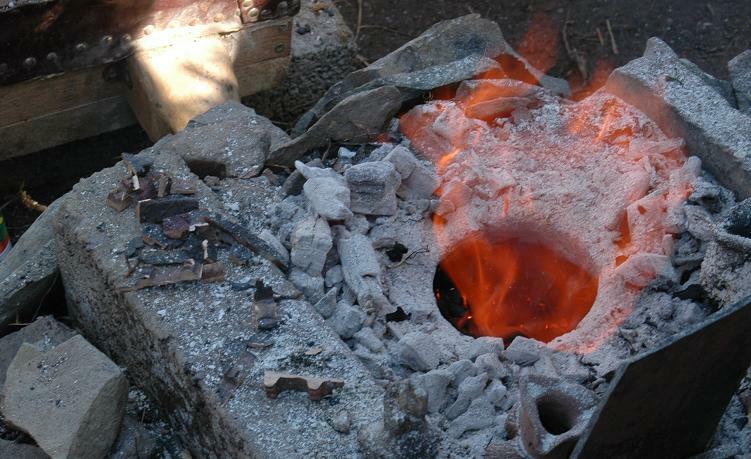 Umha Aois is a group that experiment with casting technology of the Irish Bronze Age. We had a two week symposium this year, with sixteen participants.It took place on the beautiful island of Oileain Chleire, in the west Cork Gaeltacht. 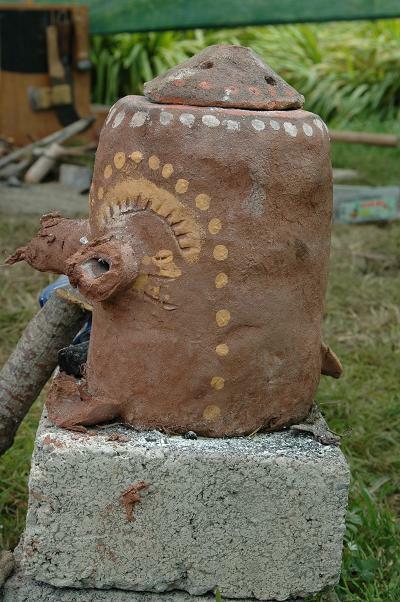 We experimented with stone and clay moulds, using a variety of techniques. Also, an important element this year was research into furnace technologies. We used free standing upright midlde eastern types, pit furnaces and bowl furnaces. A whole host of air intake systems were used, and next year we will be getting archaeologists to record the results with thermocouples, stopwatches etc. 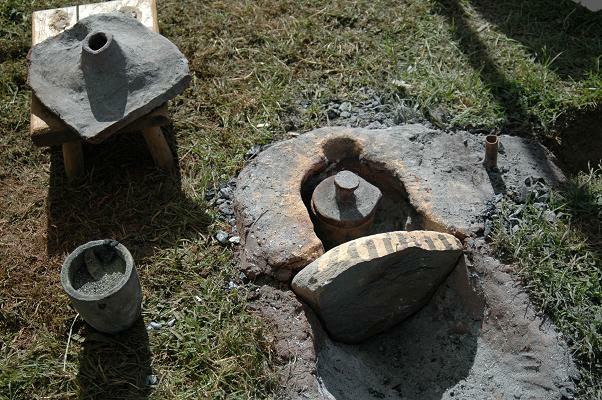 We also tried different clay mixes, including copious amounts of horse dung, for both crucibles and moulds. 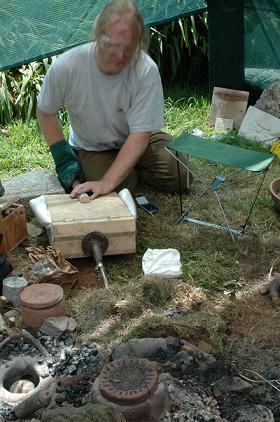 Parra O Siochain managed to heat 2 kilos of bronze in one go, using a single bellows. It took a few hours of slow, easy pumping, but was quite successful. 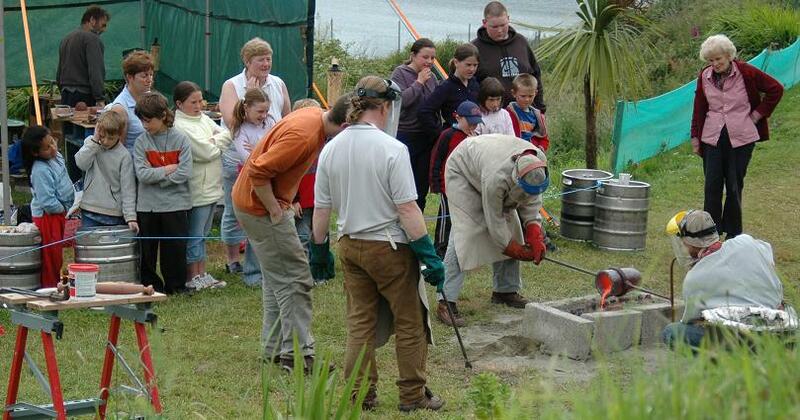 At an experiment held after the event at the Cavan County Museum Holger Lonze and I managed to heat about a kilo (from a cold, freshly made pit) to pouring temp. in about forty minutes. This was achieved by two pairs of bellows and constant (but not too vigorous) bellowing. We tried different air intake systems, and I found two particularly effective, especially when used in combination. The first is the top blowing as described here. The other system was based on a teapot stand, invented by Cliodhna Cussen. 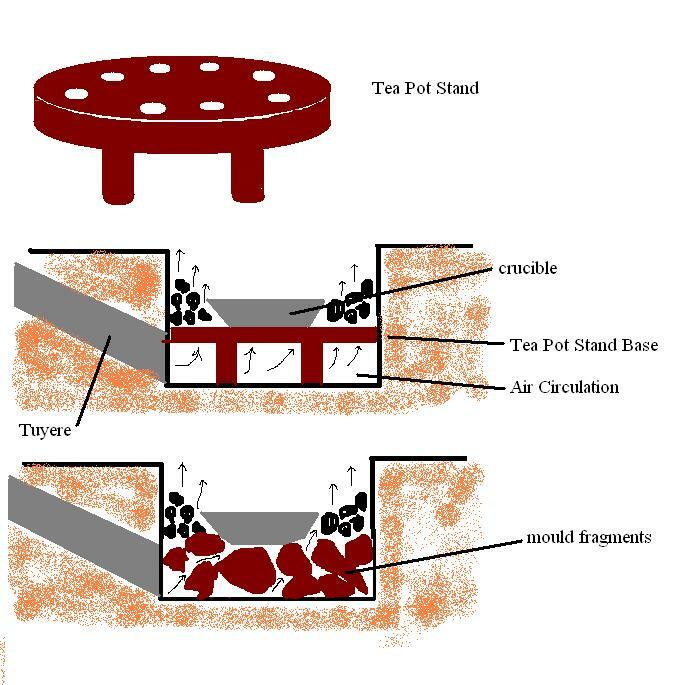 This was an elevated, perforated platform upon which the crucible stood. 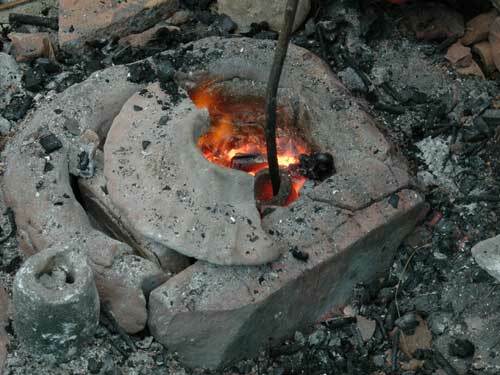 The air flows directly up from the bottom in a uniform way all around the crucible, thus distributing the heat evenly. 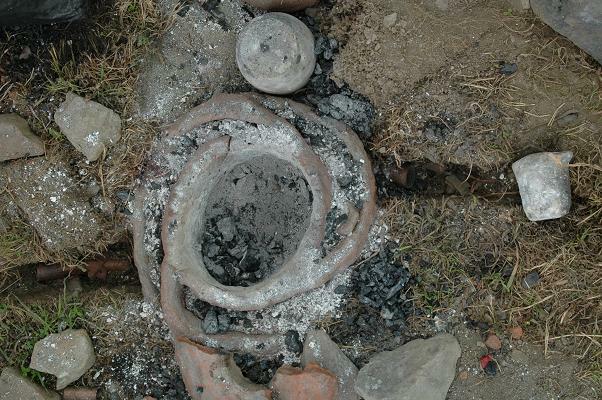 Since there are no teapot stand type devices found in the archaeological record, John suggested the use of large segments of broken pots and mould fragments in the bottom of a bowl furnace to act in a similar way, baffling the air up evenly through the charcoal. This diagram explains how it works. When you use the system described above with a top air intake (Jeroen Style) the results are mighty impressive. When we were casting into stone moulds, we used soft limestone, and only heated the moulds to about 60 deg. C. This caused them to shatter to bits. Still, I cast a sword by hand carving a stone mould. I have to tell you, this is one of the most satisfying feelings ever. Success. 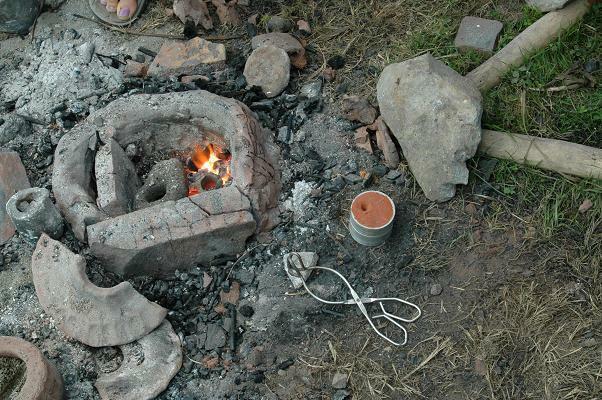 Also, I cast two swords in clay moulds, using willow rods as stiffeners. 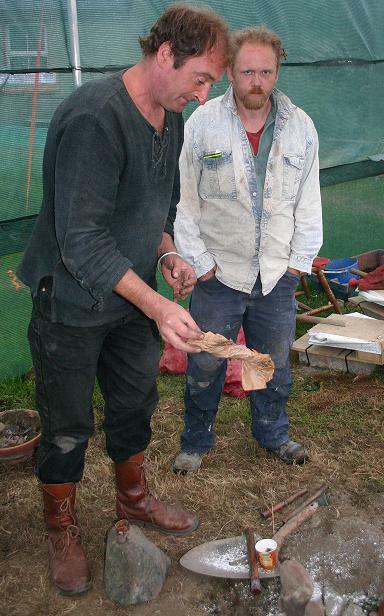 Holger and I made inner moulds of fine clay, sand and dung. We hatched the surface so the outer layer would adhere. We then made a rougher layer, witha higher amount of dung and sand in the clay, and incorporated the willow stiffeners in this layer. We fired the lot, and although they cracked a small bit in the middle, they poured a treat. One interesting thing happened. We made small vents in the clay to allow gasses to escape. After firing the moulds the sticks burnt out, and when we poured, the bronze flowed into the space and the swords had two bronze sticks attached to them up the sides. It was strange, but worked a charm. The swords ended up being a bit thick (my fault) but at least one if not both will be rescuable. We used charcoal dust on one side of the swords, and ash on the other to compare. Thus one side was rough (charcoal), and the other was smoother (ash side). Here's an image of one of the swords in the stone mould.As you can see, the mould doesn't survive all that well. Still, it's worth it for the result. 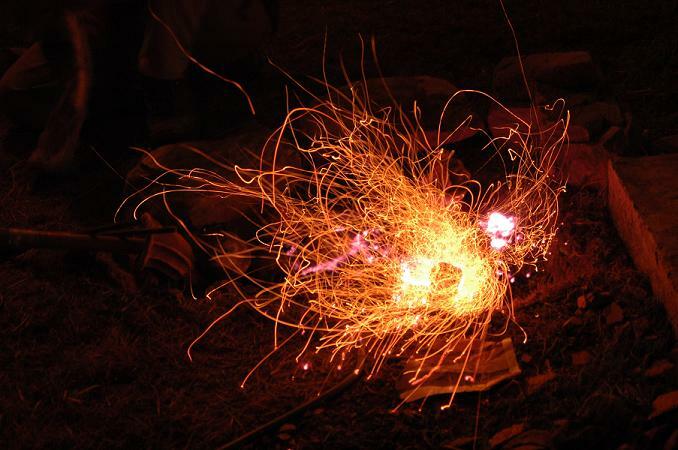 As mentioned above, we experimented with many different hearth styles, and found there are probably a great deal of variables that effect the efficiency of the system. 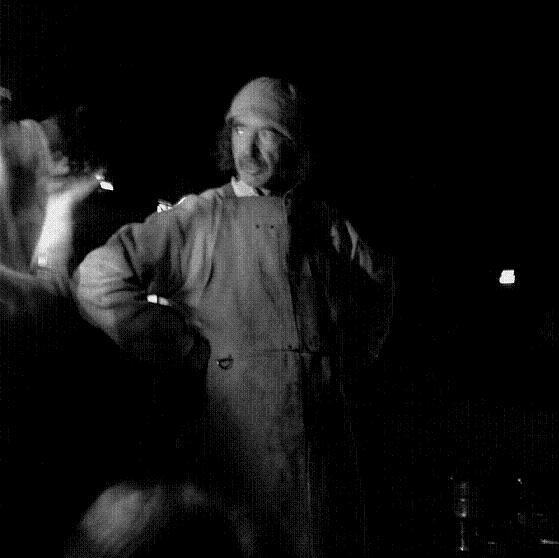 Johnny Fyffe spent many days experimenting with chimneys, draughts and hearth shapes, and eventually produced a hearth with a very high turnover, at one stage getting decent pours every half hour. Parra O Siochain is an engineer who specialises in the construction of racing motorbikes. 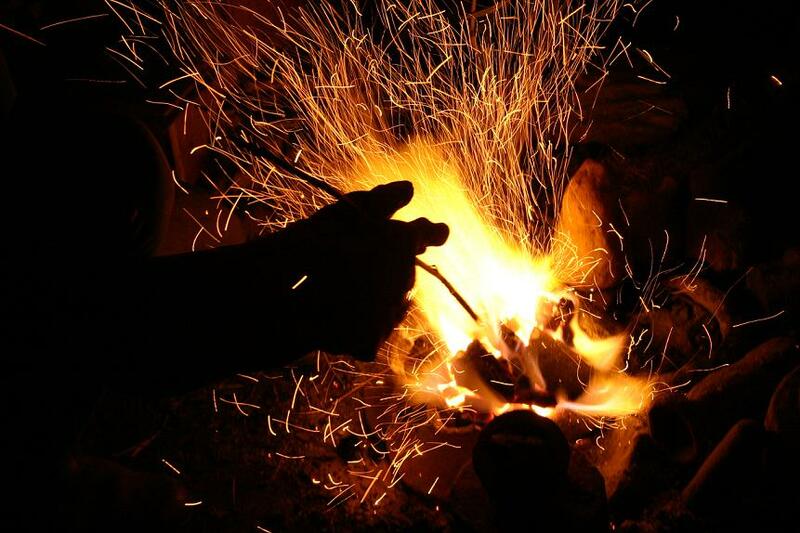 He spent several days using his know-how to construct a mighty furnace, which proved very successful in slowly melting large amounts of bronze. His watering-can shaped bowl was quite a contraption, but effective nonetheless Go Jimmy! This hearth implemented the teapot stand type arrangement to great effect. 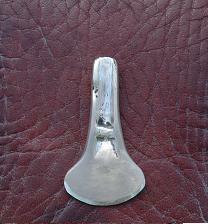 We also managed to melt some silver, pictured here, and poured a miniature axe in a sand mould. 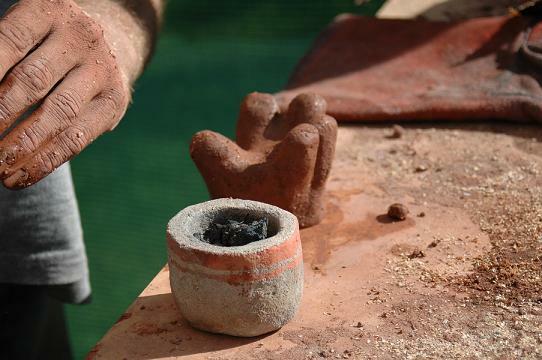 This was the only sand cast item this year, as all the others were cast in clay or stone, as part of Umha Aois's drive towards fully authentic Bronze Age methods. 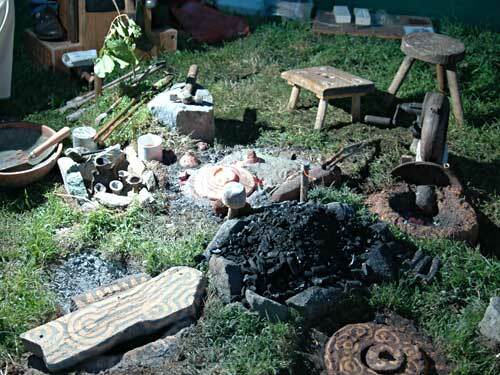 Typical work area showing furnaces, casting areas and various necessary tools. Cleaning out the ashes from a furnace. 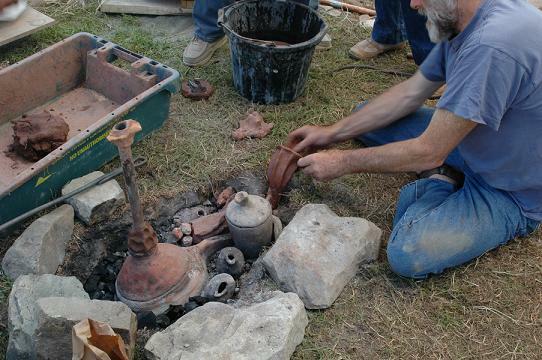 Adjusting a crucible in the furnace. 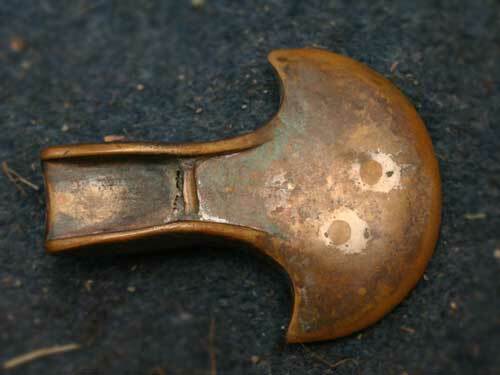 This is another bronze axehead, as cast by Brian Hackett. 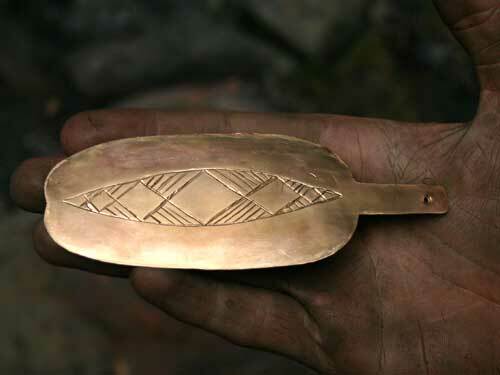 A crescent axe, poured in a wooden two piece sand mould. The two visible circles are from the pouring sprue and the rising vent. This is a palstave cast by Boyd Rankin. 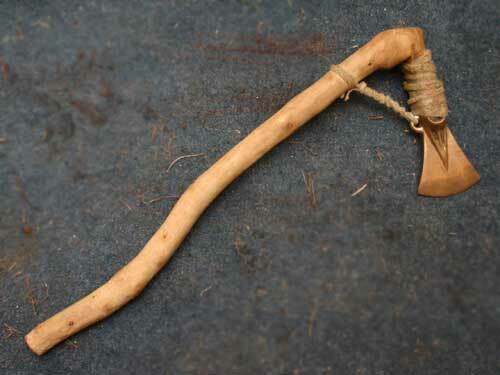 It is hafted with a wooden handle, glued in with pine resin and bound with rawhide. Bronze razor by Billy Magfhloinn. 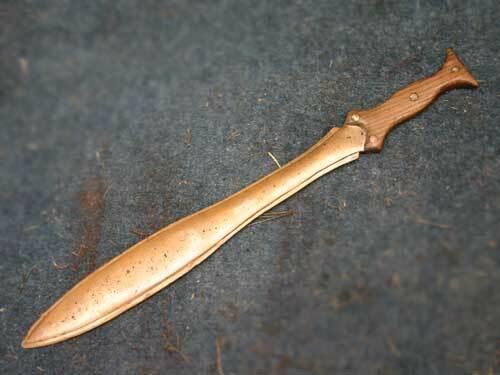 This is a spearhead cast by Brian Hackett. 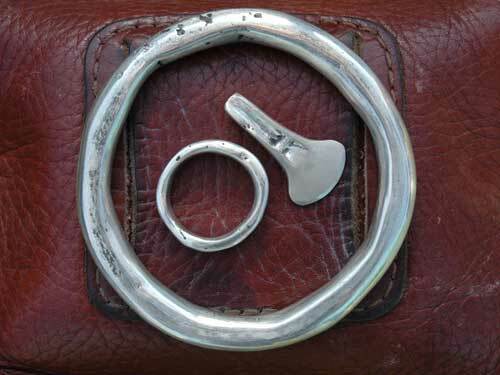 It was made from a wax model that had been created in a rubber mould taken from an original prehistoric artefact. 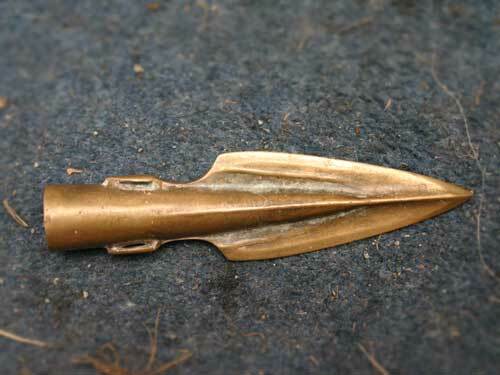 It is, in effect, and exact reproduction of a Bronze Age spearhead. As part of Umha Aois's educational aspect, we carried out a project with the Oileain Chleire primary school where each of the children got to cast their own piece, using the lost wax method. This was a complete success, and each child took home a piece they created themselves. 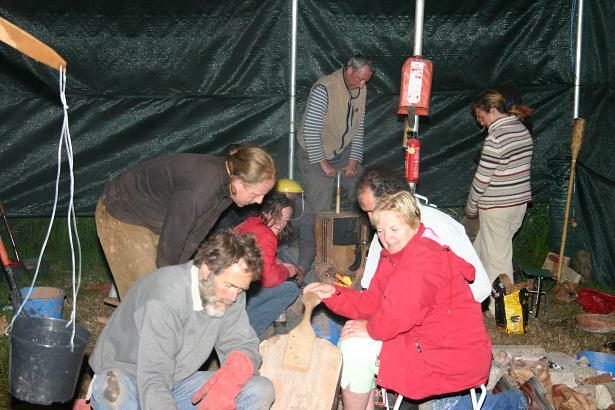 They were present at the pouring of their pieces, and needless to say were suitably impressed at the sight of the molten metal being poured (who wouldn't be impressed by that?). The group was once more led by our fearless chief Niall O Neill, with Fiona leading the way from the ceramics end of things. The usual suspects showed up again, and a few new faces, like John Rowlands, Marcus Underwood and Mary Jane Verniere. There was a total of eight different countries represented by the group this year. The dynamic was very interesting, and the expertise present from a wide variety of different backgrounds and disciplines allowed for great progress to be made. 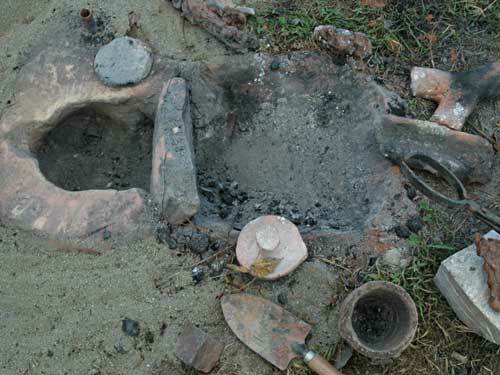 Cordula Hansen introduced this middle eastern type of furnace design, which was not only efficient in terms of fuel, but was also very quick in producing sufficient heat. In fact, this was the first oven to achieve a melt (on this project). 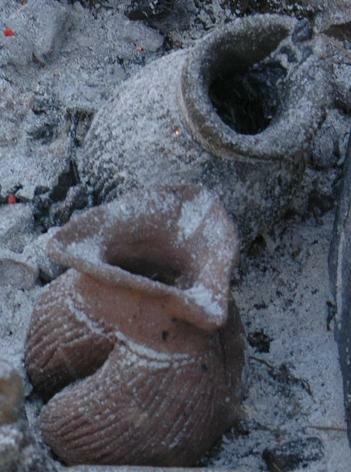 These bizarrely shaped crucibles (of so-called tritesticular type!) 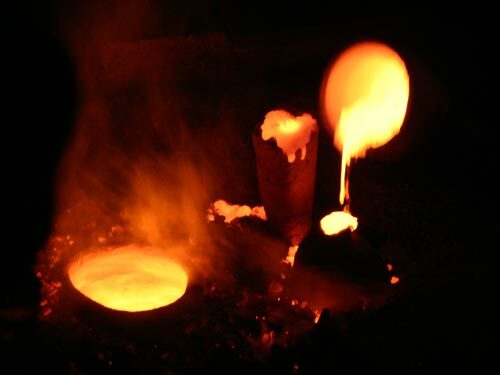 were designed to maximise surface area, allowing the bronze to be heated more efficiently. 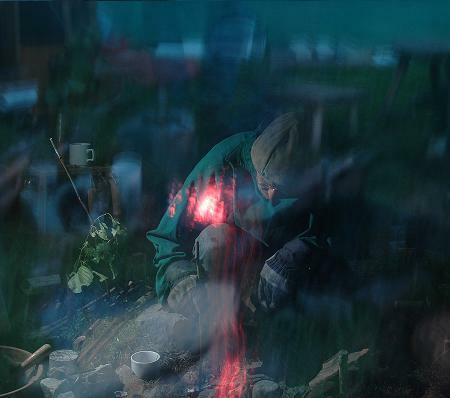 Night time pours proved the most productive (above), and the most visually interesting (below). 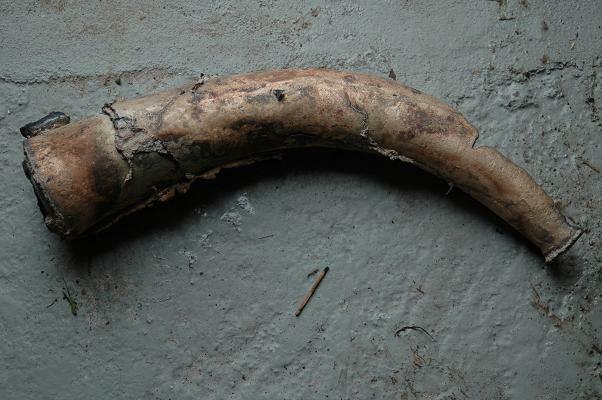 Fiona cast a horn, which is one of the most difficult Bronze Age artefacts tp reproduce. Niall cast these beautiful axes. 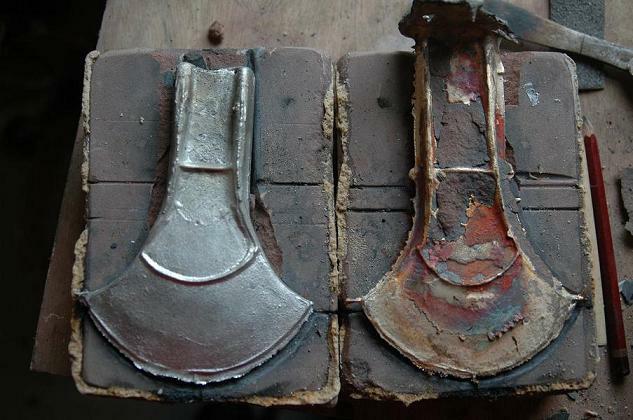 The one on the left is cast in lead, to check the registration of the mould. The one on the right is in bronze. Again, perhaps heated moulds will lead to better survival. Such is the nature of experimentation. 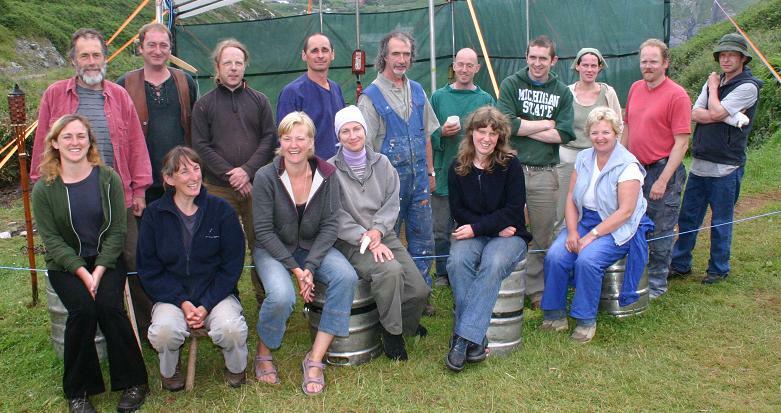 Back Row L-R: Parra O Siochain, Brian Hackett, John Rowlands, Marcus Underwood, Niall O Neill, Holger Lonze, Billy Mag Fhloinn, Sonia, Paraic Mc Goran, Johnathan Fyffe. Front Row L-R: Anne Burke, Fiona Coffey, Helle Helsner, Mary Jane Verniere, Cordula Hansen, Christine Byrne. Thanks to Pierce Hickey and Anne Burke for the great photographs.